Genuine Raw Milk Cheddar Cold Pack Cheese Spread: One taste is all it takes to realize how delicious our Raw Milk Cheddar Spreads are. Creamy, super spreadable, right from the refrigerator, just like our colored Cheddar spreads. Our special blend of aged (over 100 days) raw milk cheddar cheese, whey, cream, water and flavorings can enhance any meal or snack. We add no preservatives or artificial colors. 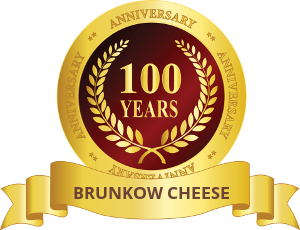 Brunkow Cheese Cold Pack Cheese is live, natural cheese with no relation to pasteurized, process cheeses. There is no heat involved, therefore the full flavor of the cheese remains. Some spreads contain extra salt, stabilizers or added sugar, but not Brunkow Cheese Cold Pack Cheese Spread. The whey (with its own milk sugar) and cream make our spread naturally sweet. The flavor is exceptionally full-bodied. 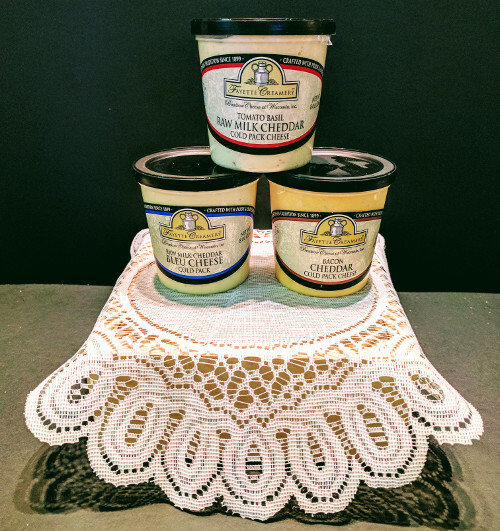 Health food enthusiasts will find our raw milk blends especially appealing since our spreads are all natural and nutritious. No preservatives, nothing artificial. Just a pure sweet, natural Raw Milk Cheddar Cheese Spread whose taste is genuine. Just like its name – Genuine Raw Milk. If you love Bleu Cheese than you are going to LOVE our Bleu (Raw Milk) Cheese Spread. Handcrafted using our creamy cheddar that is aged for over 100 days and real bleu cheese chunks incorporated into a spread that is out of this world. 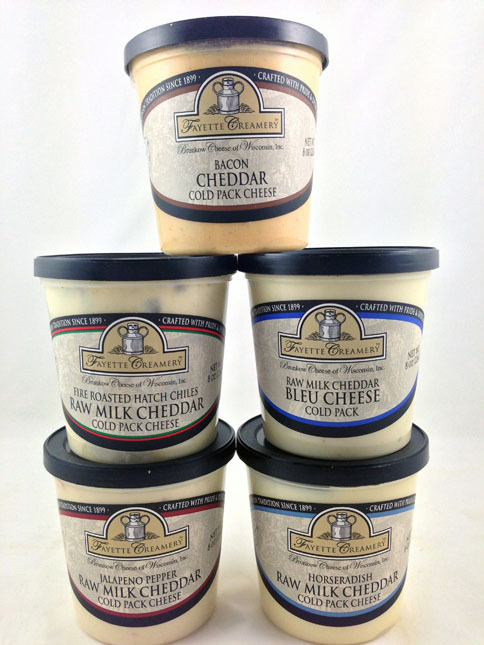 You will love our Bleu Cheese Spread on your burgers, sandwiches, baked potatoes or crackers. It is pretty much delicious on everything. Our fabulous cheddar cheese spread with everyone’s favorite BACON! It is rich tasting and buttery smooth. This is a pasteurized cheese spread. Try our Bacon Spread on crackers, bagels, pretzels or veggies. Add our Bacon Spread for a new delicious twist on to your baked potato. You will enjoy the rich and distinct flavor that you expect from a sharp cheddar, in a creamy, soft pasteurized, spreadable cheese. Great as a snack; just spread over savory crackers or artisan bread. Perfect for dipping those veggies as well. If you are looking for a cheese spread with great flavor and a little kick to it, than this is the perfect spread for you. We have combined our our creamy cheddar and have infused it with the kick of Jalapenos. When your looking to turn up the heat, our Jalapeno Raw Milk Cheese Spread is guaranteed to spice up any cracker or party. Handcrafted to perfection, our Horseradish Raw Milk Cheese Spread will make your mouth water! Creamy and flavorful with the right amount of kick from the horseradish. No artificial colors or preservatives. Spread over crackers, an excellent dip for your veggies or give that sandwich a little kick. Our Garlic Raw Milk Cheese Spread is perfect for all you garlic lovers. Our creamy cheddar is infused with savory roasted garlic. Try spreading some over a warm baguette and pop it back into the broiler for another minute. So delicious. Another great idea is incorporating our garlic spread into your mashed potatoes. Enjoy with a light-bodied white wine such as Pinot Grigio or a Sauvignon Blanc. Our handcrafted preservative-free Mild Raw Milk Cheese Spread has a very mellow flavor. Our cheddar is aged over 100 days and has a wonderful creamy texture. Great for dipping your vegetables or spread some over crackers. Makes for a perfect snack. Pairs nicely with any white wine. Also try some with your Ale or a Pilsner. So smooth and creamy our Cranberry Raw Milk Cheese Spread is the perfect spread for your Holiday party or an everyday occasion. Handcrafted from our cheddar that is aged for over 100 days, with no preservatives or artificial flavoring. Our Cranberry Spread has a nice sweet flavor, serve alongside crackers or toasted baguette slices. We have created the perfect blend of our creamy cheddar (aged over a 100 days) along with the sweet tang of sun-dried tomatoes along with fragrant basil creates a perfect balance of savory notes. Enjoy our handcrafted spread on a crostini and top it off with a slice of prosciutto. Delizioso! 17975 County Hwy F Darlington WI 53530 US Phone: 608-776-3716 Open M-F 8:00 a.m. - 4:00 p.m.